When Garrett Oliver says that beer is as old as civilization itself, he’s not kidding. 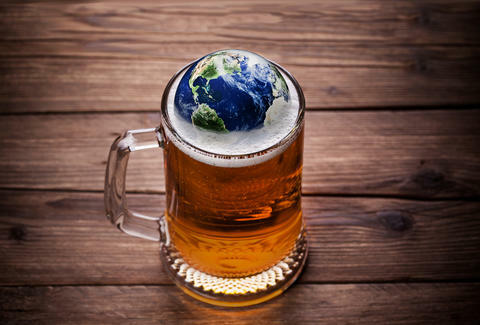 Maybe that’s why, unlike the Olympics or World Cup, global beer supremacy is a difficult thing to quantify when borders are brought into question. If you’re looking at sheer production volume numbers, China is number one. If you’re looking at consumption per capita numbers, it’s the Czech Republic. But if you’re looking at quality, innovation, and the overall scene, the numbers are far from the only things to consider, especially given the rapid change in the industry in the past decade. We hit the statistics logs, critical ranking publications, history books, and bars (obviously) to come up with a list of which countries are doing good beer the most proud these days. Sure, drinking beer in a pub is one of the first things that comes to mind when describing Irish culture. And while the country does rank number six in beer consumption per capita, Ireland’s brewery explosion is a recent development. Less than a decade ago, just five breweries controlled the market, but today that number is at 50. 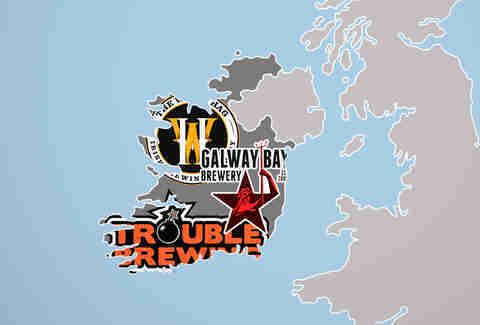 Newcomers like the White Hag, Galway Bay Brewery, and Trouble Brewing are forging a trail for critically adored craft beer in the Emerald Isle. In 2013, the government went a step further by enacting new laws that create incentives and offer education for aspiring brewers, which pretty much ensures that the growth trend will continue. New Zealand’s agricultural good fortune has helped make them one of the most quickly ascendant brewing countries in the world. Already known for barley production, their citrusy indigenous hops varieties now play a huge part in their ability to compete with some of the most popular -- and, in an increasing number of cases, best -- hop-driven American brews on the market. 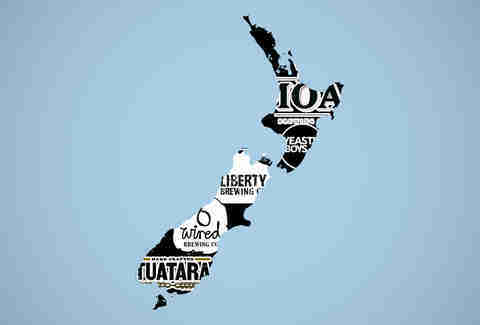 It’s not just IPAs, though: internationally adored Kiwi microbreweries Yeastie Boys, 8 Wired, Liberty Brewing, Tuatara Brewery, and Moa Brewing have exploded in popularity for all styles of beer from saisons to stouts. 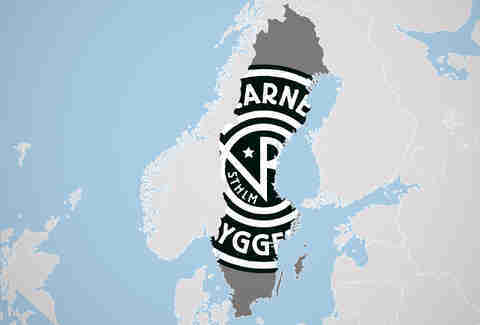 Sweden’s beer culture has begun to explode in spite of itself: local laws prohibit the sale of retail beer above 3.5% ABV outside of state-controlled shops, meaning local craft breweries have limited places to stock their brews within the country. Seemingly in defiance, new breweries are still popping up and garnering international attention, including Nya Carnegiebryggeriet, a sister brewery opened in partnership with Brooklyn Brewery. Plus, the country’s world-class beer bars, which are host to some of the most diverse international draft lists out there (the country’s second only to Canada in American beer imports), help Swedes round out their boozing. Thanks to its location deep within wine country, political backlogs, and the wine industry’s incredible lobbying power over the government, brewers have had little to no support in incentivizing beer culture. Even so, things have taken a sharp turn upwards in the past decade and a half with a veritable boom of microbreweries. Locally and internationally acclaimed brewers such as del Ducato, LoverBeer, and del Borgo are ushering in an era of change with complex, innovative approaches to traditional styles, unhindered by a base brewing tradition. You can expect Italy’s full beer potential to come to fruition in the coming years, but, even today, it’s top notch. A large part of beer culture is appreciating beers from elsewhere, and Norway’s beer bars have an uncanny ability to curate some of the best lists on the planet. This has helped to spur a craft movement of its own in the country, with breweries like Nogne Ø paving the way for young upstarts. 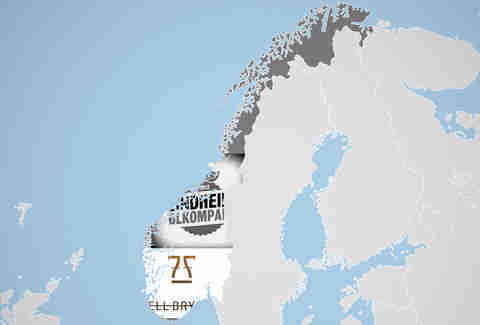 RateBeer included Fjell Bryggeri and Lindheim Ølkompani as two of the best new breweries in the world for 2015, tying them with the USA for tops on the list. The Netherlands’ international beer reputation is based mainly on Heineken (and subsidiary brewery Amstel), but there’s plenty of things going on under the trunk these days: Holland is home to two of the world’s 10 designated Trappist breweries (the only others are in Belgium, Austria, and the USA), and it’s home to a thriving beer culture with world-class bars and taprooms around the country. Microbreweries Brouwerij Emelisse and Brouwerij de Molen are the most critically adored little guys in Holland these days, and are routinely included in top global beer lists. For years, beer tradition in Canada did little to step outside of pale lagers pumped out en masse by macrobrewers. But, much like their neighbors to the South, Canada gained an initial wave of craft breweries in the early ’80s that carried through to today. 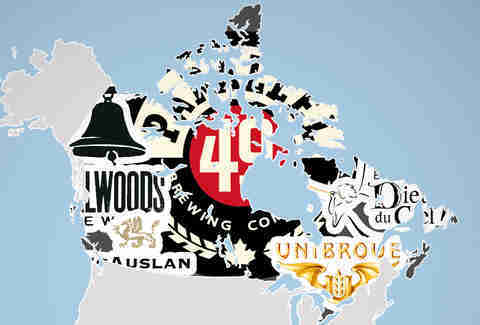 Quebec can lay claim to some of the earliest and most vocal international acclaim for its Belgian-inspired beers: almost half of the top-rated beers in the country come from the province, including Unibroue, Dieu du Ciel, and McAuslan. Couple this with a smattering of world-class beer bars from coast to coast and burgeoning microbreweries, such as Toronto’s Bellwoods and BC’s Parallel 49, and you’ve got a beer culture that can compete on the global scale. As a country known for its attention to detail in production, it should come as no surprise that great beer in Japan is far from an afterthought. Known domestically as ji-biru (“local beer”) or kurafuto bia (“craft beer”), microbreweries have been taking off since the mid-'90s when government restrictions on brewing minimums were relaxed. 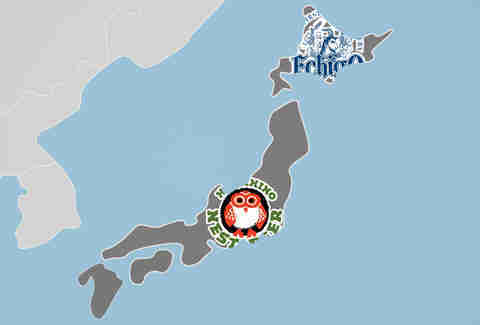 Since then, there has been no limit to the styles of beer tackled, ranging from Belgian witbiers to hoppy IPAs to coffee stouts from breweries like Kiuchi Brewery (who makes Hitachino Nest Beer) and Echigo Biru. Japanese microbreweries are also perennial winners at the International Brewing Awards, and, in the past few years, exports have increased dramatically thanks to popularity and increased production, making it easier to get your hands on a bottle (especially on the West Coast). While Denmark’s beer styles haven’t been as popular outside its borders as powerhouses like Belgium’s or Germany’s, they have a solid lineup of traditional seasonal specialties, while the tidal wave of new microbreweries emulate international styles with aplomb. The far-and-away darling of the craft beer scene there is Mikkeller, whose very presence has done plenty to elevate Denmark in the eyes of the international community and has ushered in a revitalized era of production and brewery openings. 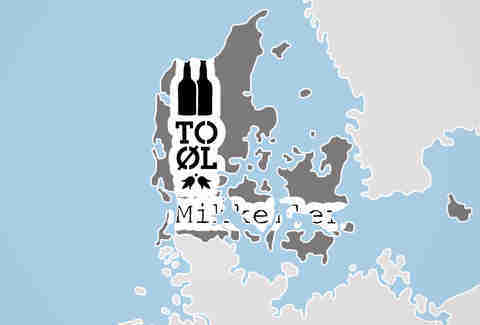 Along with other popular small breweries such as To Øl, it’s common to see Denmark represented on bottle and draft lists in the best beer bars around the world and on top beer-rating lists. Germany ranks in the top five countries in the world for volume of beer production and ranks number three for beer consumption per capita. Even with numbers aside, it’s practically against the law to make bad beer: the Reinheitsgebot (or German Beer Purity Law) has kept many breweries’ recipes the same for centuries. 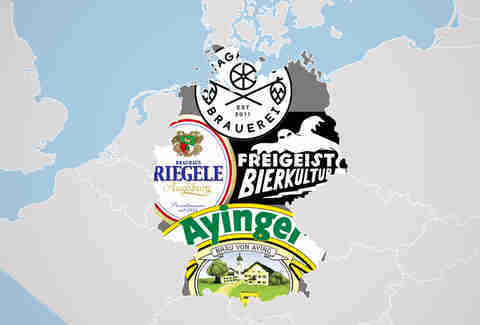 Mainstays like Ayinger still provide beers that are considered gold standards for their styles, and historic breweries, like Riegele, who exemplify popular domestic styles, keep local specialties alive despite lack of interest outside the country. Even with the stringent tie to tradition, revolutionary small breweries have been popping up: some, like Freigeist (translated as “free spirit”), highlight “endangered” German styles, while some young upstarts in Berlin, like Vagabund Brauerei, are doing international styles in what was once a beer wasteland of a city. Craft beer in the UK is not only thriving, it’s exploding: slow-but-steady changes in legislation have led to the highest number of breweries in the country since World War II, and advances in technology and investment in the industry are revitalizing everything from kegging practices to hop production. 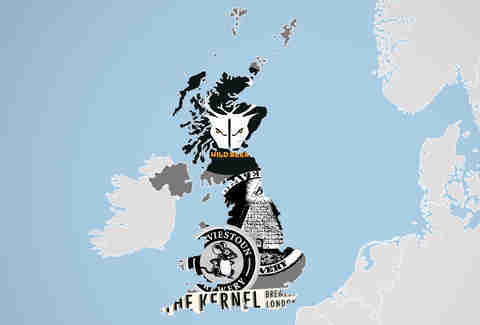 The UK now boasts the highest number of breweries in the world per capita, and innovative breweries such as the Wild Beer Co, the Kernel, Beavertown, and Harviestoun have begun to draw younger drinkers away from the pale lagers that have dominated pubs’ draft lines for decades. Plus, along with Belgium and Germany, the UK is amongst the historical core of style creation that acts as a pillar for modern beer-making. Traditionalists may deny it up and down, but there is no questioning it: the United States is a world leader in beer today. Breweries here are opening at a rate of 1.5 per day, American brews positively dominate global ranking lists, and, although the overall amount of beer consumption has dipped slightly, there has been a marked increase in the consumption of craft beers in the US of A. The American brewing style is so popular in other countries that craft brewers are expanding to Europe, including Stone’s plans for a Berlin brewery and Brooklyn Brewery’s sister operation in Sweden. Breweries like Hill Farmstead, Russian River, and 3 Floyds have entered the rarified upper atmosphere of globally adored breweries, where almost forgotten styles have been revitalized and innovated upon with a ton of success. 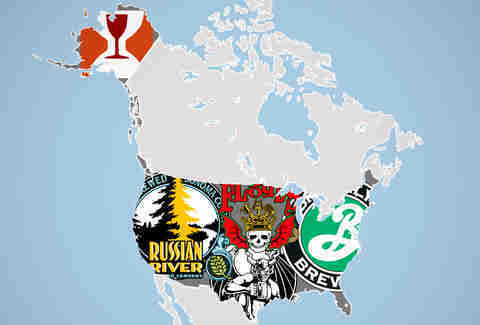 However you slice it, the unprecedented explosion of beer culture in the USA is showing no signs of slowing down. Whether you’re drinking a lambic, saison, dubbel, or witbier, Belgium is a rare example of tradition meeting innovation that lives through to present day. 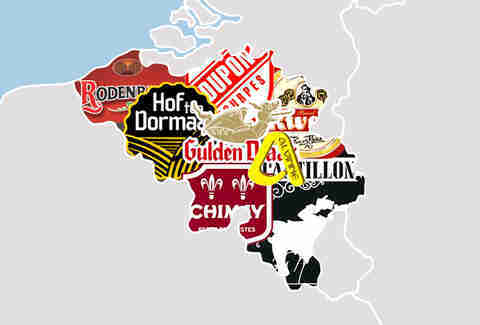 Globally, the esteem of Belgian beer has not waned in the slightest, thanks to brands like Kwak, Rodenbach, Gulden Draak, Chimay, Cantillon, Tilquin, and Brasserie Dupont. Thanks largely to preserved Belgian brewing techniques, styles are still widely emulated, and production methods, including bottle fermentation and coolships, are still used. 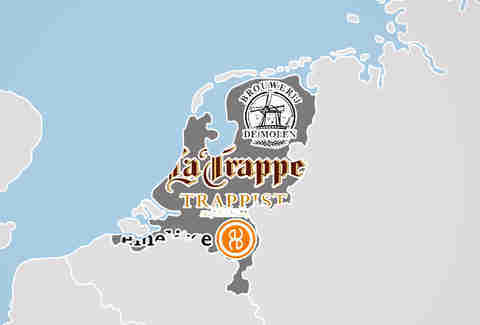 But on top of that, contemporary breweries like de la Senne, Alvinne, and Hof ten Dormaal have kept things fresh in the country by elevating traditional styles by using modern techniques and ingredients. Simply put, it’s hard to top the globally recognized and coveted brands that come from Belgium, all while still hosting a vibrant culture within its own borders.